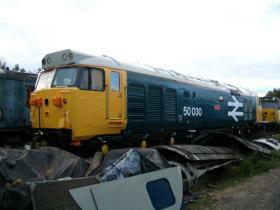 50030 bodywork restoration nears completion The finishing touches just needed applying by 29th August 2004 when RRRG member Neil Favell took this shot of 50030. Notice the cab side rot visible in earlier photos has been repaired. 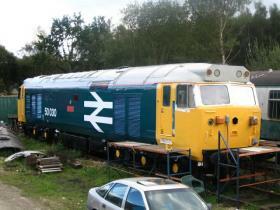 The finishing touches just needed applying by 29th August 2004 when RRRG member Neil Favell took this shot of 50030. Notice the cab side rot visible in earlier photos has been repaired. 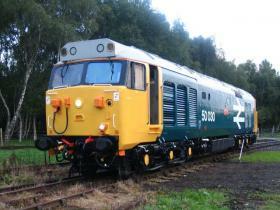 50030 displayed at Rowsley September 2004 On public display for the first time in 12 years or more, 50030 starred at the Peak Rail diesel gala on 14th September 2004. We received many favourable comments including "fresh out of Doncaster works!" and "Which train is she hauling?" (this latter question apparently in all seriousness!) 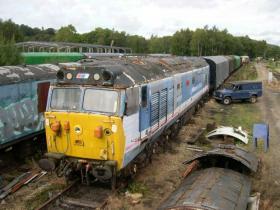 A car battery provided power for the front headlight which was recovered from a scrap Class 56. Photo: Neil Favell. On public display for the first time in 12 years or more, 50030 starred at the Peak Rail diesel gala on 14th September 2004. We received many favourable comments including "fresh out of Doncaster works!" and "Which train is she hauling?" (this latter question apparently in all seriousness!) A car battery provided power for the front headlight which was recovered from a scrap Class 56. Photo: Neil Favell. 50030 external restoration completed Practically complete, the external restoration of 50030 really has transformed the locomotive. 29th August 2004. Photo by Neil Favell. 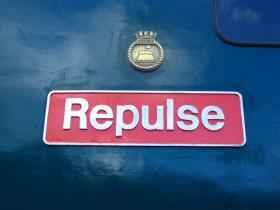 Practically complete, the external restoration of 50030 really has transformed the locomotive. 29th August 2004. Photo by Neil Favell.